Whole lesson power point presentation & Handout on Describing hair and eyes using the verbs Ser and Tener. 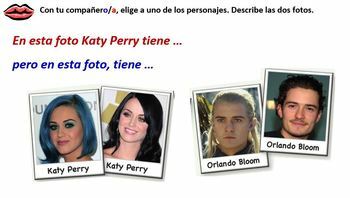 Introducing vocabulary related to eye color with the key question ¿de qué color tienes los ojos? Introducing vocabulary related to hair descriptions (color, length and style) with the key question ¿cómo tienes el pelo? Listening task - Students listen to three family members being described. They note down details in English regarding their hair, eyes and any other information mentioned. Reading task - Students read descriptions of three band members and match each text to the correct picture. They then fill in an ID card for each person, including name. age. appearance, personality and role in group. Writing task - students write a paragraph describing another member of the band. They include name. age. appearance, personality and role in group. Suitable for elementary and middle school. The lesson is planned in detail to ensure pace and interaction as well as maximize learning. The answers come up as you click. Based on the Viva 1 course. On the Full Page Slides box click on the drop down arrow. Select 2 slides and tick Scale to Fit Paper(unless already ticked). If the Frame Slides option is ticked, untick it. On the Print One Sided box click on the drop down arrow and select Print on Both Sides (Flip pages on long edge).